patient and even joyful sharing of the sufferings of Christ. Alive to God: Meditations for Everyone (Baltimore: Helicon, 1964), 64.
most known as Saint John Bosco’s spiritual father (director) from 1835 to 1860. 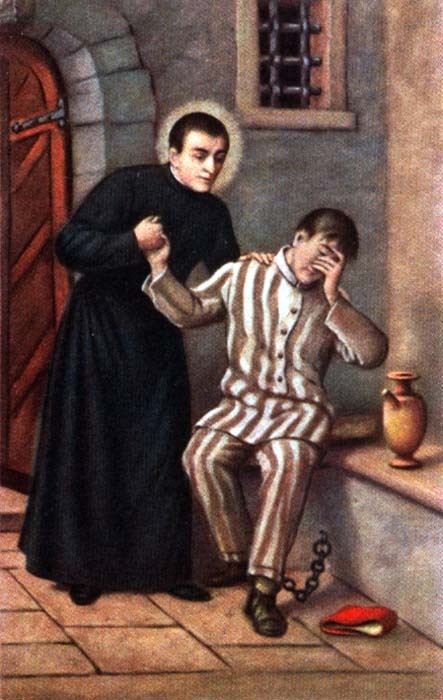 Confession and spiritual direction.” His uncle is Blessed Joseph Allamano. Saint Joseph Cafasso’s feast day is June 23.
people, thus creating a unique and effective chain.” AND how could anyone NOT take Saint Joseph Cafasso as a paradigm for Christian life? Going from point A to point B whether it is a physical move or a spiritual one is a pilgrimage. Something happens to the person making the move between points. 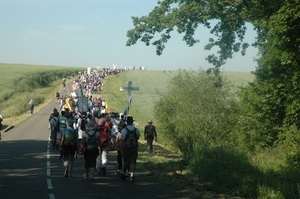 Traditionally speaking a pilgrimage is not a tourist event nor is a undertaken for frivolous reasons. Tourism is fine and necessary but I want to think about a different type physical and spiritual journey not often talked about in Catholic circles today. It is a journey; it’s a path walked; it is a time to review your life. A pilgrimage is time spent either alone or with others on a path to a change of heart, a conversion. Often we take on the burdens and the delights of a pilgrimage to gain a deeper insight into our lives as Christians asking questions about how the experience of Christ has changed me, or where I need to change based on what I discern the Lord to be asking. Saints have made pilgrimages, sinners have made and continue to make pilgrimages. 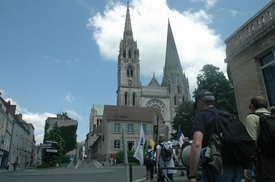 My own home parish priest just led a very beautiful pilgrimage to the Lourdes Shrine and other religious places in France this past April. Members of the lay movement Communion and Liberation makes an annual pilgrimage to the famous Marian shrine of Our Lady of Czestochowa (also here) or to the Shrine of Our Lady of Loretto and the Conventual Franciscans (and the Capuchins, CFRs and Dominicans [to sights related to Saint Dominic] do the similarly) often lead pilgrims to Assisi in order to be faithful to the path set out by Saint Francis of Assisi. The Benedictines of Saint John’s Abbey sponsor a regular pilgrimage to religious shrines and monastic foundations in Europe related to Saint Benedict and the Benedictine patrimony. OK, the point is not to catalog the pilgrimage possibilities but to give examples of current types of pilgrimages and to say that making a pilgrimage is not a dead, outmoded pious gesture. Real, good stuff happens to people on pilgrimage! One such pilgrimage taking place on annual basis is the Pilgrimage to Chartres by an international group of young people numbering in the neighborhood of 10-15k. Their form of prayer is Catholic: rosary, litany, mortification, acts of asceticism, confession of sins and the Mass according to the missal of Blessed John XXIII. Watch a most fascinating video on the experience… and the 2009 photo album …and the report with pictures of the 2010 pilgrimage in 4 installments from The Society of St. Hugh of Cluny. I am not sure you read the Office of Readings in the Divine Office, and if you don’t may I suggest that you begin; the readings from the Church Fathers is rich for meditation. The Liturgy, Mass AND the Divine Office is the daily magisterium for our faith. Today, the Church proposes a a sermon by Saint Augustine of Hippo, a portion of larger piece actually, titled “Sing to the Lord a new song.” Augustine says SO much worth chewing on, and so I find it difficult pointing out from the text only one item. Read Saint Augustine’s Semon 34…. belong to the new covenant. ourselves; it comes to us through the Holy Spirit who has been given to us. we have such an assurance, then, let us love God with the love he has given us. for you would be unable to love me if you did not possess me already. lives: Sing to the Lord a new song. singers themselves. If you desire to praise him, then live what you express. Live good lives, and you yourselves will be his praise.